Every year, thousands of people are killed or injured in car accidents. In the blink of an eye, carelessness can cause tragedy. It can happen to anyone on our roads and highways. Traffic fatalities have declined for many years. However, in the last few years, deaths due to an auto accident have increased significantly. In 2015, auto accident fatalities rose 10.5% to 35,485 people killed. In 2016, auto accident fatalities climbed another 5.6% to 37,461 people killed. Undoubtedly, distracted driving is playing a role in the rapid jumps in the number of wrongful deaths due to traffic accidents. If you’ve been hurt in a car accident, the personal injury attorneys at the Underwood Law Office understand the difficulties you’re facing. You are likely without a car. You’re in pain and suffering. You probably have doctors’ appointments and medical bills. You may have missed time from work and have lost wages. You have to deal with insurance companies. Or, even worse, the person that caused the auto accident may have been uninsured. When you are concerned about your family’s welfare, it’s hard to focus on healing your injuries. In 2016, 12,514 people died in alcohol-impaired driving crashes according to the United States Department of Transportation, National Highway Traffic Safety Administration, Traffic Safety Facts. That was 33% of all traffic-related deaths in the United States. Texas is a large state. For Texas, in 2016, 1,670 people died in traffic accidents in which alcohol was a factor. That was 13% of the entire nation’s alcohol related fatalities. Forty-four percent (44%) of all Texas traffic fatalities involved alcohol. For comparison a small state like West Virginia, in 2016, 80 people died in traffic accidents in which alcohol was a factor. Thirty percent (30%) of all 269 West Virginia traffic fatalities involved alcohol. For the entire country, in 2016, 10,111 people died in auto accidents involving speeding. That was 27% of the 37,461 total traffic deaths in the United States according to National Highway Traffic Safety Administration. Driving too fast for existing road conditions kills. In Texas, in 2016, 1,069 people died in car crashes that involved speeding. That was 28% of the 3,776 total Texas traffic deaths. For comparison, in West Virginia, 22% of the traffic deaths (60 out of 269) involved speeding. For the entire country, in 2016, 3,157 people died in car crashes that involved distracted drivers. That was 9% of the 37,461 total traffic deaths in the United States according to National Highway Traffic Safety Administration. Younger drivers have higher rates of distracted driving. Whether it is texting while driving, talking on the phone or using Facebook, distracted driving is growing every day. Compulsory Insurance Laws require that all registered vehicles be covered by insurance. In Texas, the state requires minimum liability limits of $30,000 for each injured person, up to $60,000 per accident, and $25,000 for property damage for each accident. This is called 30/60/25. It is basic coverage. As a comparison, in West Virginia, auto insurance minimum limits are: 25/50/25 liability insurance and 25/50/25 uninsured motorist coverage. West Virginia requires you to have $25,000 in bodily injury liability coverage per person, up to $50,000.00 per accident, and $25,000.00 for property damage per accident. If your vehicle is involved in an accident with a car without insurance, you must have uninsurance. The minimum additional coverage it provides is $25,000.00 per person, and $50,000.00 per accident. Many drivers carry only enough coverage to meet the minimum required limits. Others drive unlawfully with no insurance. If another driver is at fault in your accident, you might have to rely on your own insurance coverage for accidents involving uninsured or underinsured motorists (UM/UIM). If other drivers share the blame for your car accident, or if the accident was partially your fault, this can affect what compensation you receive, It also affects how much the other drivers must pay. Under the comparative fault statutes of both Texas and West Virginia law, you cannot recover compensation if your own fault in your auto accident equals or exceeds 50 percent of the combined negligence of others involved in the accident. If you have a serious injury, the most important thing you can do right after any automobile accident is see a doctor. Do not delay seeing a doctor if you are hurt. You may need medical evaluation and treatment immediately, to ensure your health and safety, and to document your injuries. Tell your doctor about everywhere you hurt, and ensure that your doctor records that information in your medical report. You want to be sure that your doctor knows about every injury. The doctor must be informed so he or she can evaluate you for injuries – possibly dangerous or life-altering ones – that you might not know you have. As soon after the accident as you can, you must report your automobile mishap to your own insurance company. If you wait too long, you risk complications with your claim. If you don’t give notice of the mishap soon enough, your insurance company may reject your claim. It’s important that you do not give any recorded or written statement about your mishap to any insurance company, whether yours or that of another person involved in the accident, until you have consulted with an experienced personal injury lawyer. It’s also a good idea to begin keeping notes when beginning auto casuality claims. Record notes about who you speak to, when you spoke and what you discussed. Record the details about how the mishap has affected your daily life. Write down specific information about your recovery, your injuries, and the expenses you have incurred because of the accident and your medical treatment. Those things can be easy to forget. Keeping a good record means you’ll have the information at hand if it’s needed to support your claim for compensation. Never sign any agreements presented to you by an insurance adjuster who wants to settle your claim without getting advice from an experienced accident lawyer at a personal injury law firm. A skilled personal injury lawyer, like those at Underwood Law Office, can help prevent you from giving up important rights and settling your auto injury case for less than you deserve. 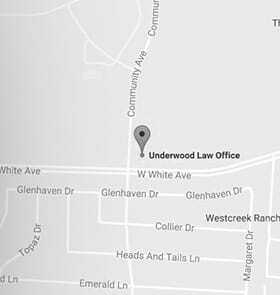 Let an experienced McKinney Car Accident Lawyer at Underwood Law Office help after your auto wreck. We have handled many decades of personal injury cases. Our trial lawyers can help you recover the maximum compensation available in your auto injury case. Our McKinney, Texas law firm serves all of Dallas and Fort Worth, including Plano, Frisco, Allen and McKinney, TX.